Been a while since there’s been an update. Sorry about that. I’ve been cripplingly ill for the last few days. I’m sure you’ll hear about it soon enough via one of the characters. Probably Jill. Nothing. Anyway. This week I have to focus on a play I have to get done by mid week. So there likely won’t be an update till later. SO…in the meantime enjoy some stuff that got me through the worst of it. The promise of an awesome movie. Our country losing the freedoms it was founded upon. Sigh. Why won’t it embed like it used to? 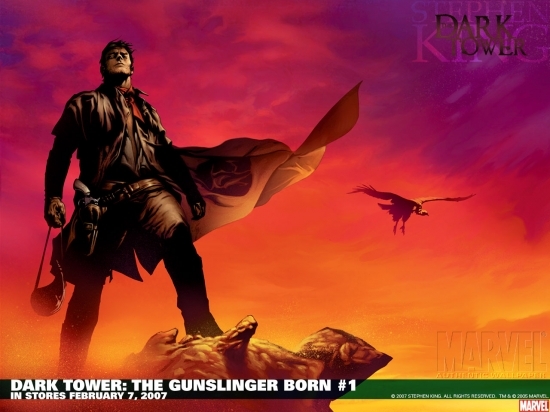 The Gunslinger. Both the novel and the graphic novel. And one more Batman thing. Anyway. I’m glad I don’t feel like this anymore. Ugh. Links to videos seem so unprofessional. WTF?